As our Blasfamous word spreads across the country we see an increasing demand from YOU our devoted minions to rep Blasfome and your home state at the same time. 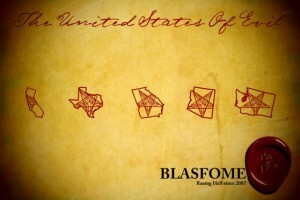 In order to accommodate your requests we have launched the “United States of Evil” Die-cut Sticker Series. The “United States of Evil” Die-Cut Series features all Fifty of the United States Released in Ten installments of Five. The second installment (pictured above) California, Texas, Washington, Georgia and Arizona. Each die-cut is painstakingly manufactured to the highest standards by the one and only Bobby Buckets, just like those coins on television, but without the Franklin Mint. The die-cuts are measure roughly 12 inches this will vary slightly depending on the size and shape of the state. Show pride in your state at blasfome.com and in-store.